Constructed to fit all Infant Car Seats! (if you have a newer 07/08 design that is larger than the standard, feel free to contact us to verify before placing your order). Create your own reversible design for two chic looks! Gently padded for 100% comfort and safety! 100% washable and dryable. 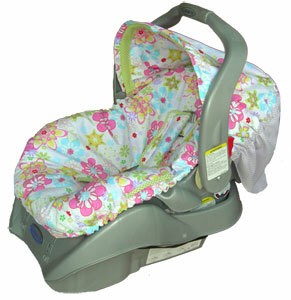 Comes with two coordinating seat belt strap covers to create comfort for your child’s neck. Darling canopy cover is also included! Cleverly placed interior pocket for child’s favorite toy, pacifier or bag of snacks! All Car Seat Covers come in a darling and handy clear vinyl tote with zip top and silk rope handle making traveling a breeze and keeps your cover clean and dry when not in use!